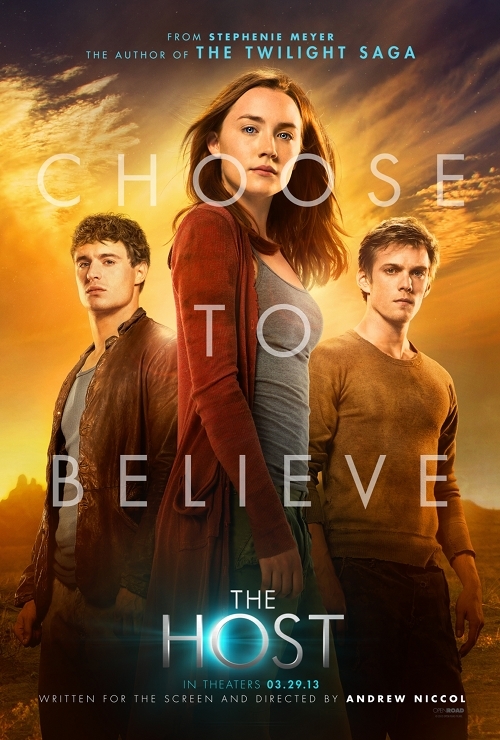 “The Host” is brought to you by author Stephenie Meyer, who penned the novel while counting her “Twilight” money. Instead of vampires with an alternative lifestyle, we have aliens who take over our bodies and perfect them and the planet. They kill us with kindness and everything is for the common good. You know, like Obamacare. Among the last few “unoccupied” is Melanie (Saoirse Ronan from Hanna), who has managed to keep her brother Jamie (Chandler Canterbury from A Bag of Hammers) safe for a few years. She meets Jared (Max Irons from Red Riding Hood) who seems to be the last man on earth, and they fall in love, naturally. And then, she gets taken (different movie) and implanted with a Host named Wanderer. I did not read the book, and that is a great place for a character to have competing inner monologues. So, how do you show that on screen? They chose the old 1950s Twilight Zone method of echoing voiceover. Although Ronan is an amazing talent, her inner voice/host comes off as annoying, while the device yields abrupt responses disconnected from emotion. The militant group of invading aliens all look like missionaries as they “seek” the last few humans for conversion. They don’t want to hurt anybody, and the only evil one, known as The Seeker (Diane Kruger of Inglourious Basterds) is certain that Melanie/Wanderer is going to be a problem. I figure they stuck to the book, as it felt like they were checking off scenes as they went. This happens when the novelist is a producer on the movie and may not understand how to transform her inner invasion to the screen. There is a great theme here, but the movie did not pull it off. I dated a girl with multiple voices in her head, and it was terrifying. I got none of that from watching “The Host.” What I did get was horrible dialogue from great actors like William Hurt (The Village) who played Jeb, Melanie’s uncle. He actually says, “I am a big fan of science fiction movies, but I never thought I would be living one.” And he was living in the caves of a volcano that had the best set dressing I have ever seen in a cave. Nice lamps, pictures on the wall, Fred Flintsone style windows and all the trimmings. We were due for an advancement of Jack Finney’s “Invasion of the Body Snatchers,” and Meyer does move the ball down the field by taking us inside the occupied mind and letting us know the body snatchers are beings too. This sets up a great dynamic in the main character and for the other characters as well. The ingredients are all there, but the soufflé fell flat. The entire world felt fake to me, and I never felt the horror of the invasion or the desperation of true love in what was an interesting love quadrangle. Director Andrew Niccol (In Time) has nowhere to hide, as he wrote the screenplay. He has done some good work in the past, but this one fell short.